We try to respond to the wishes and needs you and your dog may have. 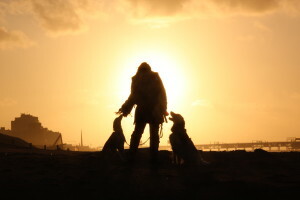 We look at every dog as an individual, and each individual needs another approach. Training is always part of our walks, so dogs that aren’t the best listeners, can’t walk off the leash (yet) or have behavioural issues are welcome. Your dog will be walked by a certificated dog trainer and canine behavioural therapist (in training). We think knowledge is extremely important. After all, we’re dealing with living creatures! That’s why we have knowledge of breeds, behaviour, training methods and First Aid for dogs. You are ensured of a professional approach. Each walk is based on strengthening wanted behaviour and replacing unwanted behaviour. That’s why we use “positive” training, for dogs whom aren’t just obedient, but happy as well. Next to this, we keep to the dog walking etiquettes, which you can find on our website. After all, nobody wants their dog to be a bother to others. Would you be able to combine a walk with a dog in your street, then both dogs aren’t just entitled to a longer walk. You both get a considerable discount as well. If you decide to make use of our dog walking service, we will discuss your wishes and the possibilities of your dog. Of course we will have a short walk together so you can show the specific needs and habits of your dog. After that the contract will be signed and we will get your house keys. Our working area for the dog walking service contains Voorburg, Leidschendam, Rijswijk, Scheveningen and a big part of the Hague. For questions and/ or making an appointment you can reach me by phone, email, Whatsapp and text message. In case you have a private caller ID, refrain from calling and please send a text message or an email instead. I will contact you as soon as possible.